It’s opening day at Derry Fair, and young Dinny Brown can’t wait to see the carousel, the animals, the cotton candy, and the hot-air balloon. But Mama’s baking pies for the contest and Daddy’s chopping wood to sell, and it seems as if Dinny will never make it to the fair on time! Won’t someone finish up their chores and take him to the fair? 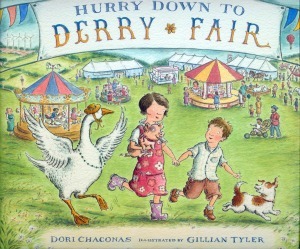 Dori Chaconas and Gillian Tyler offer a rhythmic read-aloud that celebrates the delights of the county fair, culminating in a bustling panoramic gatefold that lets readers explore along with young Dinny. Behind the scenes: This story started out as a much different thing than the story it ended up being. The main character was a baby who was too young to voice his wish to go to town to see the sights. Thanks to editors Amy Ehrlich and Andrea Tompa for helping shape it into publishable and more pleasant form. And to Gillian Tyler for her warmly detailed art. Anxious to enjoy the rides, animals, and treats at a local fair, Dinny goes to the members of his family and urges them to hurry. He ends up helping his mother by whisking eggs for her lemon pies; his father, by stacking firewood to sell; and his sister, by grooming animals to show. Grandma Patty, though, drops everything to take Dinny to the fair, while the rest of the family hurries after them. Told in rhyming verse, the story moves along at a modest pace and allows plenty of scope for the amiable artwork. Though Dinny’s farm has an old-fashioned look, the wind turbines on a nearby field are certainly up-to-date. Tyler’s appealing ink drawings, warmed with gentle colors, offer plenty of details to engage children. The final spread is a standout, folding out to four pages wide and offering a detailed, panoramic view of activities at the local fair.